There’s something magical about the taste combination of chocolate and coffee together, don’t you think!? This chocolate fat bomb recipe takes flavor to a new height with the addition of a magic sugar free coffee liqueur flavor syrup that I found. The flavor is deeper and more intense than other chocolate fat bomb recipes that I have made before. The addition of walnut butter makes it smooth and a walnut half garnish makes it crunchy and pretty! I keep these in the freezer for those chocolate emergencies. You know what I’m talking about right? Let’s get going so you can be enjoying these in no time at all! I just want to talk about the tools for a moment because having the right tools for the job saves both time and money. For the silicon pans, I have bought the cheap ones from China and after a short while they harden and crack. Don’t be tempted by the $2 silicon pans! My Wilton pans are under $10 and I have been using them for years without a problem. If you don’t have a set of pyrex glass measuring cups put this on your birthday or Christmas wish list. When I bake, make pancakes for the kids or make this chocolate fat bomb recipe, you mix everything right in the pyrex mixing cup and pour it out. Only 1 bowl to wash! Measure Coconut oil, walnut butter, cocoa powder, coffee liqueur syrup, and sweetener into a glass measuring cup with pouring spout. Microwave for 30-40 seconds and no more! It’s very important to still see lumpy stuff in the glass otherwise the coconut oil seems to separate and your chocolate won’t look pretty. Stir the contents of the glass until all the coconut oil is melted. Pour into the silicon molds. If you are using the Wilton 24 cavity mold that I use, fill each cavity half full. Place one walnut half onto each cavity. Place tray in the fridge or freezer until set. For 2 of these Mocha Walnut Coffee Bites: 180 calories, 3 Total Carbs (1 net Carb), 21 g Fat, 3 g Protein. These chocolate fat bombs keep very well in the freezer in a zip lock bag and I would advise you to do that because they really do taste so good! 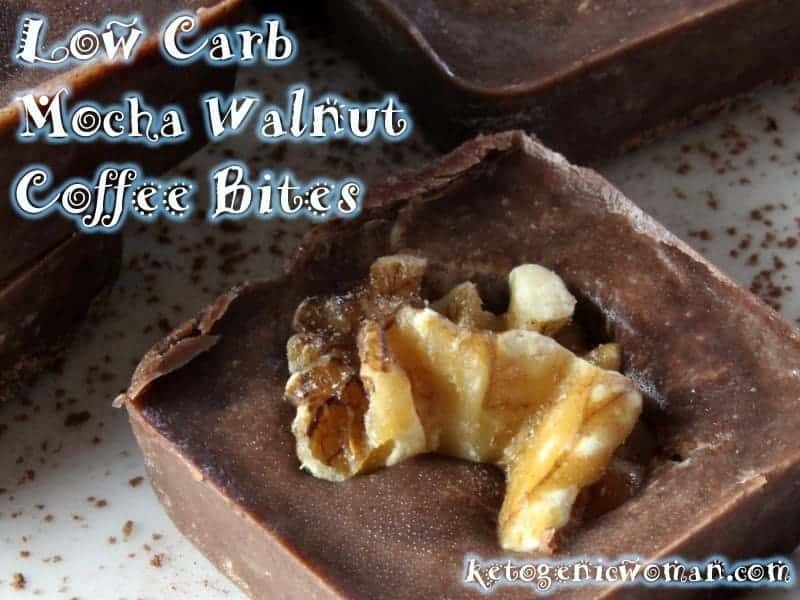 Tagged chocolate fat bomb recipes, chocolate fat bombs recipe, keto fat bomb recipe, low carb chocolate recipes, low carb fat bombs recipe. Bookmark the permalink. Can I substitute Coconut Butter for Coconut oil or is it the same thing? You know, I think it’s probably close enough. If it’s what I am thinking it might be a little more concentrated that coconut oil (which hardens at cold temps) but it should still work just fine. If you end up using it, let us know how it is! Thanks for trying the recipe! I have a batch of these setting up right now. I omitted the coffee syrup because I just didn’t have any, and I was interested in getting some fat bombs made up without going to the store. 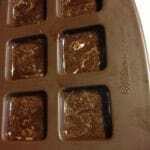 I substituted with almond butter and dark cocoa, and placed a good pinch of coconut flakes in the candy molds before I poured the mixture into them. I hope to come out with coconut-topped dark cocoa almond fat bombs. Guess I’ll know in an hour or so. They will have a much different flavor but will still be terrific! Sorry I am French so I don’t know what is.splenda ! Love this!! However I made some substitutions. Used Trader Joe’s sesame butter & sugar free salted caramel syrup. Delicious!! oh, now that sounds yummy! Thanks for sharing your tweak! Love your recipes, can I take this with my ketonic diet? If that is the same thing as a keto diet, then yes! Enjoy! I don’t eat sucralose so any recipe that has a sugar free syrup isn’t going to work. Could I add powdered espresso? Seeing as the syrups are a lquid, I could cut down on the cocoa powder or up the cream by 2 T. Any thoughts? Can you substitute butter for the coconut oil? I’ve not tried it that way ever so can’t really say for sure. I think you could but it would be a softer bite, which could be nice as well. Maybe cut the recipe in half and try it with just the butter alone? Good luck with it! Can i use this with my egg diet while out and about? I have a hard time being able to get my fats in? Also my husband doesn’t like tea so the tea fat bombs wouldn’t work for him. If not is there any other bombs we could use? These are not for the egg fast, due to the non compliant ingredients. But they are great for regular low carb afterwards! You can make simple fat bombs for the egg fast just with equal parts butter, coconut oil and Torani sugar free syrups. Pour into silicon molds and freeze until you want to eat them. love your recipes!, do you have a newsletter/blog I could get by email?.